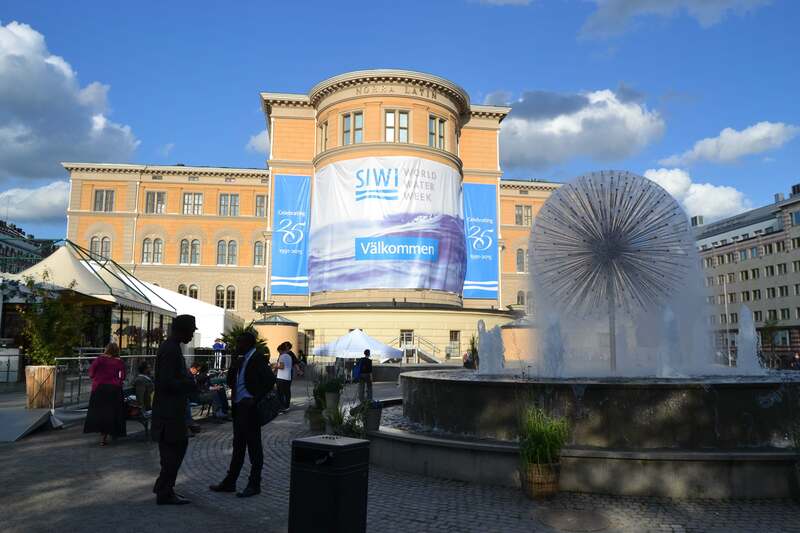 After the call of proposal published in November 2015 and the first preparatory meeting which took place in December, the Swiss Water Partnership got involved in the preparation of a total of 9 thematic events for the Stockholm World Water Week 2016. On each of these events, two or more members of the Swiss Water Partnership were involved. For some of these events it would still be possible to join in for the detailed preparation of the event. Do not hesitate to contact the Secretariat of the Swiss Water Partnership. This interesting technical paper of Guy Hutton and Mili Varugehese from the Water and Sanitation Programme, estimates the costs of reaching the Water, Santiation and Hygiene (WASH) related targets of the Sustainable Development Goal 6, based on the proposed indicators. It estimates the investments to reach the targets to be three times higher than the current investment levels, around USD 114 billion per year. In September 2015, the United Nation’s General Assembly adopted the new Agenda 2030 for sustainable development. In the dedicated water Sustainable Development Goal (SDG) on water, two targets are dedicated to WASH (6.1 and 6.2). Target 6.1 aims at “achieving universal and equitable access to safe and affordable drinking water for all”. An estimate of 4’531’000’000 people worldwide do not yet have a water supply responding to standards needed to meet this target. Target 6.2 aims at “achieving universal access to adequate and equitable sanitation and hygiene for all and end open defecation (…)”. For sanitation, the total population to be reached is estimated to be of 5’309’000’000 while for hygiene (measure on access to basic hygiene), 4’828’000’000 people need to be reached in order to meet target 6.2. Table summarizing the number of people to serve to achieve the targets set by SDG 6.1 and 6.2. Can be found on page 4 of the technical report. The study finds that current expenditures, if they were to be targeted properly, would be enough to provide universal access to basic WASH services (an improved community water source within a 30 minutes round trip, an improved toilet and a hand-washing station with soap and water for every household). However, the costs of achieving target 6.1 and 6.2 are estimated to be around USD 114 billion per year (range from USD 74 billion to USD 116 billion) or 0.39% (range 0.26% to 0.55%) of the sum of the Gross Domestic Product (GDP) of the 140 countries included. This amount is about three times the current investment levels. In both cases, it has to be noted that the global picture hides considerable inter-regional disparities, as well as disparities between countries. Globally, countries with the lowest GDP will have the highest investment to undertake to meet targets 6.1 and 6.2. Furthermore, affordability of the services provided is also a key issue, as alone the “operation costs of basic WASH services can ad up to more than 5% of the poverty income levels”. This will require new and innovative ways of financing, as traditional bi- and multilateral aid will not be sufficient. Growing tax revenues of developing countries will contribute to it or by an adequate channelling of private sector investment. In this regard, the paper also concludes that “sustained universal coverage requires more than capital inflows: financial and institutional strengthening will be needed to ensure that capital investments translate into effective service delivery”. 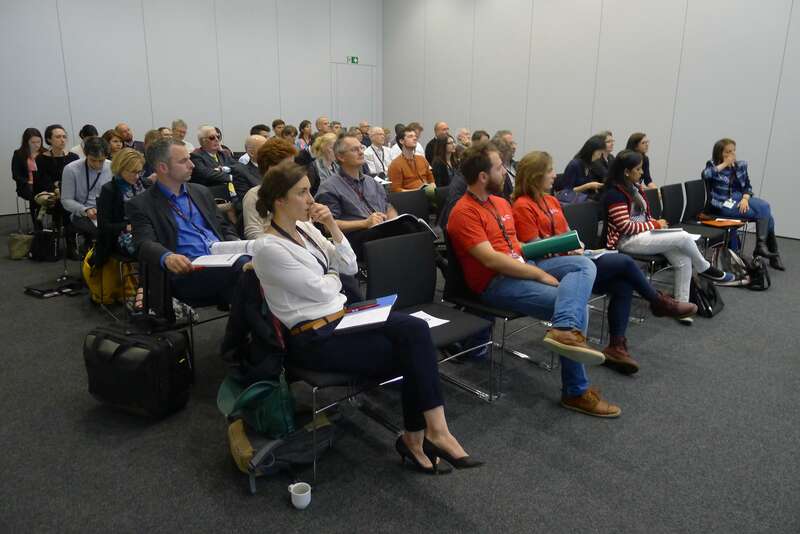 The General Assembly of the Swiss Water Partnership (SWP) will take place on May 18 at EPFL. The General Assembly has, amongst others, the task to elect the members of the steering board of the SWP. This board is composed of 12 members. Even though elected as individuals, SB members are key decision makers in SWP member organizations across sector and scale. Two members of the SWP steering board see their mandate (lasting 3 years) end this year. 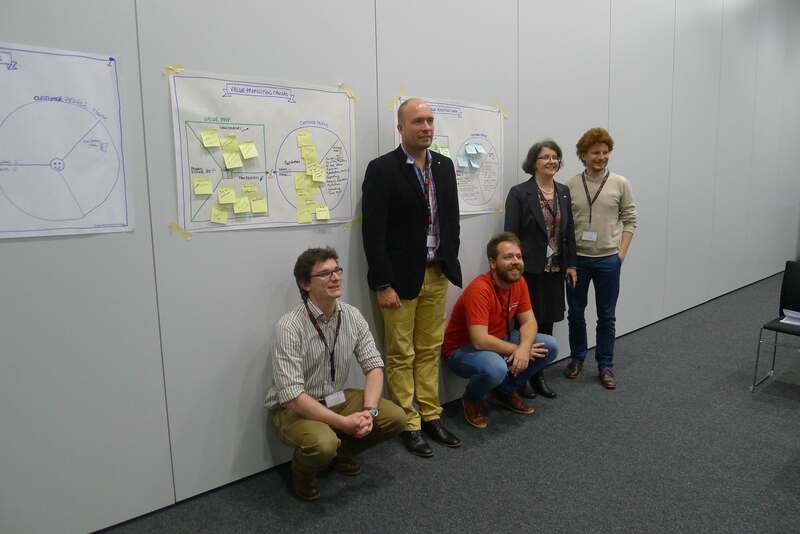 These two members are Thomas Zeller, currently SWP Co-Chair, and Darcy Molnar, from the Institute of Environmental Engineering of ETH Zürich. Both members accepted to represent themselves for an additional mandate. If you would also like to run for the election into the SWP steering board, you can do so by letting the letting the SWP Secretariat know until April 04. Elections will be held electronically prior to the General Assembly (further information will follow). The call for applications for the International ReSource Award for resilience in water management is opened until 30 April 2016. The award “acknowledge social entrepreneurial initiatives aimed at prototyping or scaling up new approaches for resolving existing social and/or ecological issues related to sustainable water management practices”. The prize comprises financial and non-financial (coaching/expert advice) support to the three finalist for a total amount of USD 150’000. 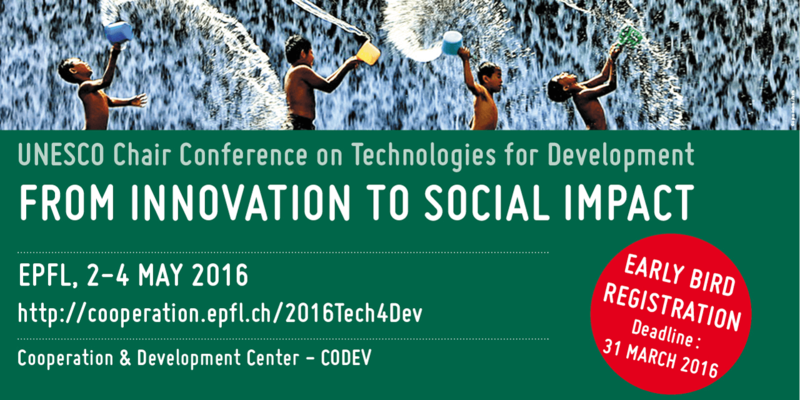 Cewas, in cooperation with Impact Hub, Swiss Water Partnership, Swiss Bluetec Bridge and euphoria, organizes the Call for Ideas 2016. Do you have an innovative idea that addresses the specific needs of low-income people in developing and emerging countries regarding sanitation, water and resource management? 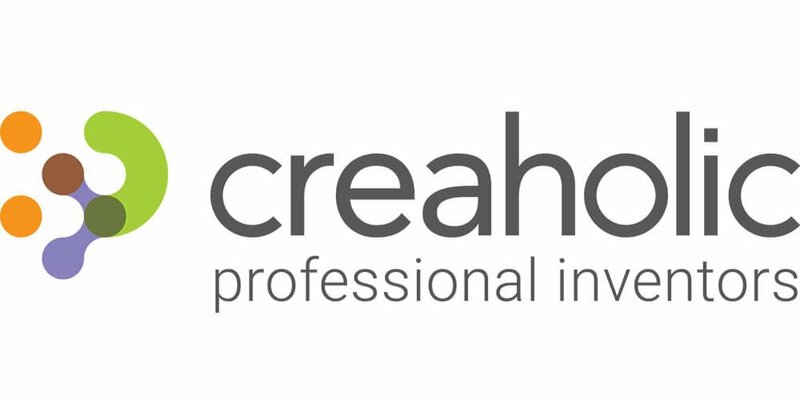 Are you looking for support and mentorship to further develop and put your idea into practice? 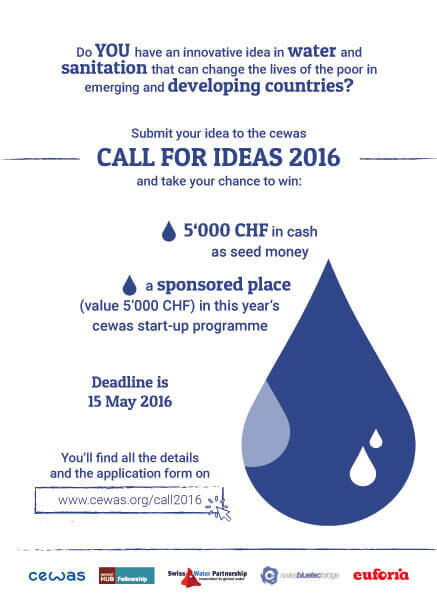 Submit your idea by 15th May 2016 and take your chance to win the cewas Call for Ideas endowed with 5’000 CHF and secure a sponsored place in the cewas start up programme 2016/17. The base of the pyramid (BoP) is the largest and poorest socio-economic group: the 3 billion people who live on less than US$2.50 per day. Few companies have so far addressed the opportunities in designing and delivering goods and services to BoP customers. However this might change in the near future: interest for these customers is growing, on the one hand, because of its purchasing power as a group (estimated at $5,000bn a year according to the International Finance Corporation), and on the other driven by the new demanding Sustainable Development Goals. Discover innovative business solutions for BoP markets: relevant business experiences from around the world will be showcased, highlighting opportunities and challenges for business solutions for BoP markets & customers as well as sharing best practices for market entry, piloting and scale-up. Exchange cross-sector insights & network: There will be participants and showcases from the agriculture, energy, sanitation and water sectors, representing start-ups, SMEs, social entrepreneurs, the finance and non-profit world. This means a unique chance for you to talk, learn from others, share insights, look for partners and meet people who face similar challenges. Join us in this interactive session on the essential characteristics of BoP markets and customers and learn more on how your organisation can succeed in such a context. You can find more detailed information on the event here. 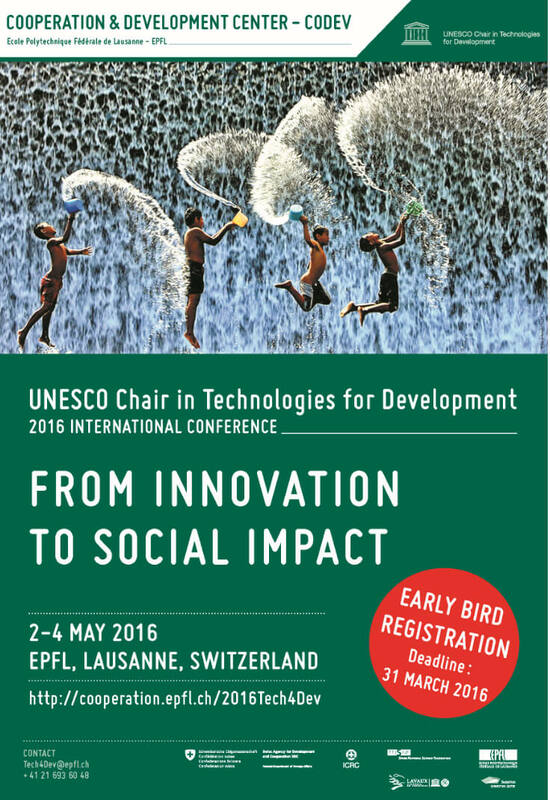 Registrations are open and early bird registrations run until 31.03.2016.